Now you can purchase and instantly download the latest editions of Davies bestselling Interactive Mock Exams—and save shipping costs in the bargain. Start studying for the registry exams today, or earn 15 hours CME credit with no delays. It's easy. Click here. Know the latest in ultrasound technology, upcoming national events, and news about our authors, editors, and team. Mouse over the News FYI tab in the left column. To view our free educational Webseries, head on over to our YouTube channel. Sign up to receive the latest promotions, discounts, and news by email. Register here. Don’t take the registry exam without it! 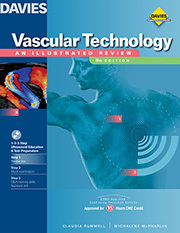 New 5th Edition of Vascular Technology: An Illustrated Review. SDMS- approved for 15 hours CME credits. Learn More. "A good review for a working technologist as well as introducing me to new material." Click here to see what your colleagues are saying. Our mission is your success. Learn how we've helped your fellow colleagues and what they think of Davies.